No other opera by Mozart has as many different versions, sketches, fragments and variants of the individual numbers as Mitridate. In total, seven arias and a duet survive in original versions which were jettisoned or adapted before the first performance, and of these, six survive complete (or, in the case of 'Lungi da te', almost complete). It was perhaps inevitable that the original cast should have been suspicious of a fourteen-year-old foreigner who had never before written an opera seria, but their reasons for demanding these rewrites often seem to reflect practical considerations and, in some cases, their own vanity rather than any qualitative judgement on the music. Mozart’s original setting of 'Al destin che la minaccia' is in G major, the key in which the preceding recitative ends. It successfully combines Aspasia’s high-status dignity and plaintive vulnerability, but it is perhaps understandable that Antonia Bernasconi—already an established prima donna who three years earlier had created the title role in Gluck’s Alceste—might want a more festively virtuosic vehicle for the opening aria of the opera. By writing the final setting in C major Mozart was able to add a pair of trumpets, which bring a more regal splendour to the sound-world, and Bernasconi must surely have been satisfied with the results. The final version of this aria is in ABAB form, a noble adagio leading into a brilliant allegro before both parts are repeated. The key is F major, and the orchestra includes pairs of flutes, oboes and horns. Mozart composed only the first adagio of his original version, which shares the same key and orchestration; presumably his prima donna was happy with the fiery allegro sections but felt that a new opening was required. In creating a complete performing version of the original version, then, and to provide a context for Mozart’s enticing first draft, Stanley Sadie needed to create an entire recapitulation of the adagio, this time staying in the home key and modelling it closely on Mozart’s corresponding treatment of his material in the final version. Again, he did so with great skill, taste and good judgement. This was the aria that caused Mozart the most problems, mainly due to the cantankerous demands of the tenor Guglielmo d’Ettore. Four sketches, in three different keys, survive, of which this F major setting is the most complete. It contains all of the vocal line except the last couple of bars, the bass line until the end of the ‘B’ section, violin parts for the four-bar introduction and four short violin cues (of one or two bars’ duration each) between the vocal phrases. From this relatively sparse material the late and much missed Mozart scholar Stanley Sadie fleshed out an extremely accomplished and idiomatic completion of the aria, skilfully extending the violins’ triplet figuration from the opening and adding the standard pairs of oboes and horns to the orchestration. I had the privilege of conducting the first performance of this completion, and a few years later I incorporated it into a staged production of the opera. In returning to it for this recording I took the liberty of making several tiny cosmetic changes, mainly in the accompanying violin figurations and once or twice in the lapping oboe parts. These changes probably ended up totalling several dozen in number, but are almost all, I hope and suspect, imperceptible; all of the real work is Stanley’s, and any credit is due entirely to him. Mozart’s initial setting of Ismene’s first aria is scored for oboes, horns, trumpets and strings. The use of trumpets is particularly surprising, given the key of B flat major and the sense of uneasy disappointment in Ismene’s situation, but they bring a wonderfully mellow and burnished sound to the aria. The three-in-a-bar metre is also a little unexpected, but again brings a quirkily wistful quality to the dramatic situation. Mozart’s final version of the aria is altogether more orthodox, scored for strings only and reverting to a four-in-a-bar metre. It establishes Ismene’s vocal credentials more impressively, to be sure, but perhaps at the expense of a more original and insightful characterization. Mozart’s first setting of Sifare’s Act 2 aria, 'Lungi da te', shares many similarities with the final version. Pietro Benedetti, the original Sifare, was the last cast member to reach Milan—he had still not arrived by the beginning of December—and his arias would therefore have been among the last to be written; Mozart’s father wrote that Wolfgang 'prefers awaiting his presence in order to fit the costume to the figure'. If the initial version of 'Lungi da te' was not a perfect fit for Benedetti, it must have already been fairly comfortable; a second version inverts the melodic shape and varies numerous details, but without radically altering the colour or musical landscape of the original, while the third and final version retains the vocal line of this second version unchanged but adds an extended horn solo. 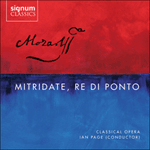 This haunting addition, evocative of an alphorn calling from mountain-top to mountain-top, is a very different use of the instrument from that in Mozart’s subsequent horn concertos, and tellingly underlines the pathos of Sifare’s farewell to Aspasia as he prepares to go far away from her. The aria effectively becomes a double concerto, with the two solo lines interlinking like the two parting lovers. Mozart’s manuscript of the original version breaks off at the end of the ‘B’ section, but it is a fairly straightforward task to create a completion using Mozart’s existing music—the corresponding place in the second version successfully achieves the harmonic link to the reprise, and I have abbreviated this recapitulation to bring it in line with other comparable arias in the opera. Giuseppe Cicognani, the original Sifare, can have had few complaints about the music that Mozart wrote for him, and the decision to rewrite this aria was probably Mozart’s own, founded on a need for greater economy and brevity within the context of the whole opera. Essentially the final version is a considerably shortened version of the original setting, sharing the same musical ideas but condensing them into a much more compact form. The original is perhaps a little repetitive, but is musically more substantial. Again, its scoring includes two trumpets, which are not used in the revision. The original version of this duet is very different from the final version in terms of key—E flat major as opposed to A major—and structure—the opening adagio is reprised, unlike in the final version, creating an ABAB structure. Mozart may have realised that Aspasia’s magnificent Act 3 aria, 'Pallid’ ombre' was also in E flat major, or he may have been made aware of the tradition which Salieri referred to in his memoirs, that such a love duet should always be in A major. Either way, the original setting is a wonderful piece, albeit longer and even more difficult than the final version; indeed, the fiendish challenges of the vocal writing may well have been cause enough for the singers to insist on a rewrite. Mozart only wrote one setting of Mitridate’s final aria, but in the event d’Ettore insisted on singing Gasparini’s setting anyway. Mozart conceded to his wishes—he probably had little choice by this stage—and as a result the published aria was until very recently thought to be Mozart’s own. In truth, though, Gasparini’s setting does not suffer too badly by comparison with Mozart’s, and it serves as a telling reminder that Mozart’s genius evolved from a musical language that was already highly developed and finely tuned to the dramatic requirements of opera seria.